Set up Schedules and Events on my phone system? Schedules and Events allows the administrator to set up the Time schedule and Holiday schedule for Phone System services. To route calls based on the time of the day (business or after hours), you can configure the Time schedule. 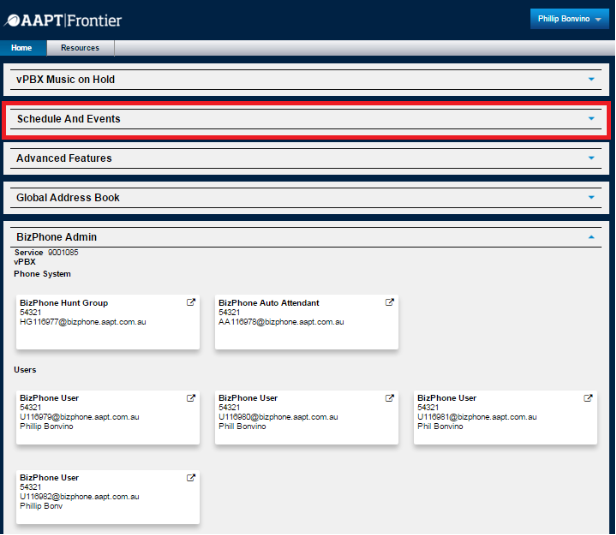 You can also configure your company holiday schedule by identifying the dates of the holiday in the Holiday schedule. To access the Schedules and Events, click on the icon next to “Schedules and Events” on the main Schedules and Events page will appear (below). Events page will appear (below). Create a schedule by entering the Schedule Name and the Schedule Type. Schedule Name - Enter the name for the schedule.For example Christmas Holiday, etc. Time: if you wish to create a Time Schedule (Business or After hours). Click “Save” under the Create Schedule section to save the schedule you have just created. You can create multiple schedules by repeating the same steps above.